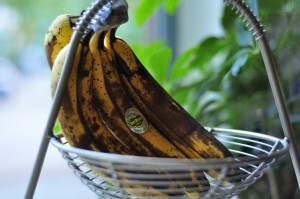 We go through so many bananas in our house that its rare we have any ripe enough for homemade banana bread. Sometimes when I’m craving this baked treat I’ll purposefully seek out older bananas at the grocery store in hopes they’ll turn brown before we get a chance to eat them! The other day I made two loaves of homemade banana bread using my mom’s recipe as a guide. I added 1/4 cup sour cream to the batter, which made it super moist and extra delicious. Two days later, we still had a loaf left, so I put it to use this morning for breakfast. Homemade Banana Bread French Toast topped with real maple syrup was a decadent and delicious way to start the day! Blend first seven ingredients well. In a separate bowl, mix dry ingredients together, then add to the banana batter. Mix until just moistened. Pour batter into two loaf pans and bake for 45-50 minutes. In a large shallow dish, whisk eggs, milk, syrup, vanilla and cinnamon. Heat a large skillet over medium heat. Add a pat of butter. 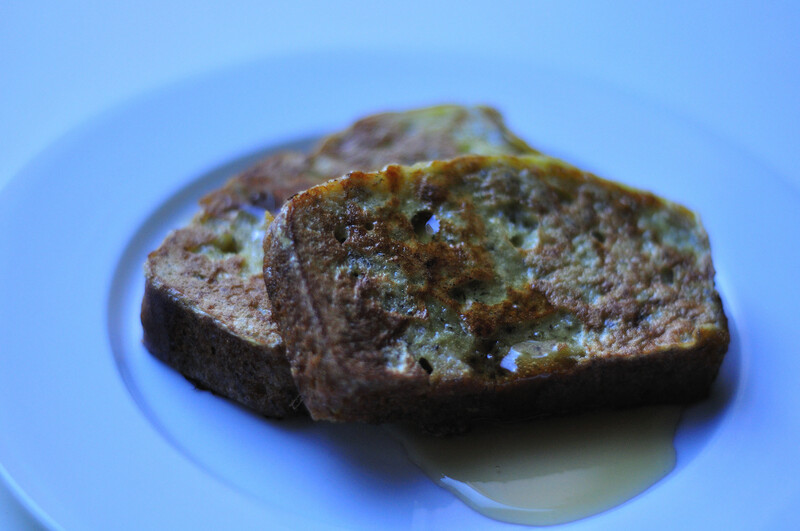 Drench two slices of bread in the egg mixture, and gently drop into the skillet. Cook for 2 minutes, or until browned on one side. Flip and cook for another 1-2 minutes. OMG!! Does Sunday morning breakfast get any better than this? It’s a shame I’ve already used up all of my bananas – that looks amazing! I JUST did a version of this this morning! Well, no b-bread, but we took (almost, same prob in our family we eat em too fast!) overripe nanas mashed with ricotta that needed to be used and maple syrup….spread thickly between two slices of bread (wholegrain but recipe asked for french) and then carry on as usual for this….SO GOOD. Sunday, yes Sunday.